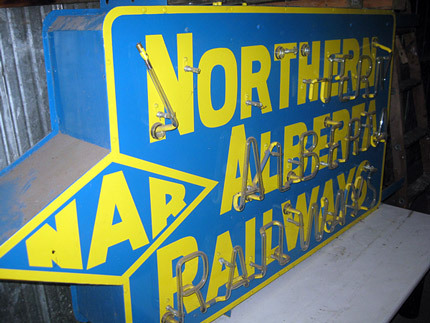 The Northern Alberta Railways (NAR) were a conglomeration of a number of smaller railway companies which served the north of Alberta to move grain, silver, coal and other products south to link into the TransCanada rail system. Composite members included the Edmonton, Dunvegan and British Columbia Railway, The Central Canada Railway, the Pembina Valley Railway, and the Alberta and the Great Waterways Railway. In the 1920s most of these companies’ bonds were guaranteed by the Alberta Government, which eventually took them over, consolidated their operations and leased them to the Canadian Pacific Railway to run. In 1926, the operational agreement was transferred to the Canadian National Railway Company. By 1929, both the CPR and the CNR jointly owned and operated the NAR companies and worked together to build and maintain expansion to the lines in the north as needed. CN purchased the entire system in 1979. The NAR sign was on the Canadian Pacific Office building downtown on Jasper Avenue, which served as the Railways' headquarters.